The Phillies will not be in Washington for the Nationals’ home opener in 2011. 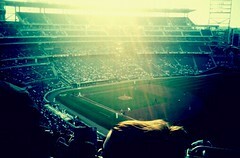 I repeat: The Phillies will not be in Washington for the Nationals’ home opener in 2011. Instead, the Atlanta Braves will face the Washington Nationals in Washington’s 78th home opener since 1901 on Thursday, March 31. I know what you’re thinking: Regular season baseball in March? What gives? During the off-season The Commissioner’s Special Committee for On-Field Matters agreed to begin the regular season earlier and during the week to avoid playing World Series games in November. During the 2011 season, the Nationals will host 12 homestands, three of which last 10 games a piece (July 1-10, August 16-25 and September 2-11). The full schedule is now available at Nationals.com. I can’t find a source now but I remember reading where there is a desire by some in MLB to make the LDS best of seven, thus adding two games. Would this cancel out the time gained by the earlier start? I’ll look into this for you. I too am interesting in seeing what the buzz is. I know there’s been talk of it among fans, but an official comment from MLB? I’ll see what I can dig up! They’ve already scheduled the World Series to start on October 19 (with a potential Game 7 on October 27), so I’m assuming they’re not tinkering with the playoff system this season. Note that there are no official playoff change proposals being considered by MLB at this time (at least they’re not saying that there are, anyway). But baseball writers are coming up with different ideas. One other scheme proposed by SI’s Tom Verducci also involves second wild card team in each league, but they would be forced to play a “play-in” game the day after the season with the other wild card, with the winner going the following day to the Division Series against the team with the best record. I was looking just now at the Nats schedule. They play at home all four weekends in September. That’s very odd, and I’m not sure it has ever happened.